Step 1 Steam the potatoes until tender, about 15 minutes, and set aside. When cool enough to handle, cut into bite-sized pieces. Step 2 Fry cut-up bacon in a dry skillet over medium heat until brown, about 10 minutes. Discard all but about 1 to 2 teaspoons of fat and add the shallots. Cook until the shallots are fragrant and tender, about 3 minutes. Step 3Add the artichokes and the water, cover tightly, and cook until the artichokes are tender, 10 to 15 minutes. Step 4Remove the lid, increase the heat to high and cook, stirring, until the liquid has reduced to traces of syrup, about 5 minutes. Step 5Add the cut-up potatoes and stir to coat with juices. Add the cream and salt to taste and continue cooking over high heat until the cream has thickened and reduced enough to coat the potatoes and artichokes lightly, about 5 minutes. Step 6Remove from heat and stir in the minced chives before turning into a serving bowl. In Recipes-list.com we have selected the most viewed recipes from category - Main courses Quick and easy . Enjoy the best recipes specially selected for you! 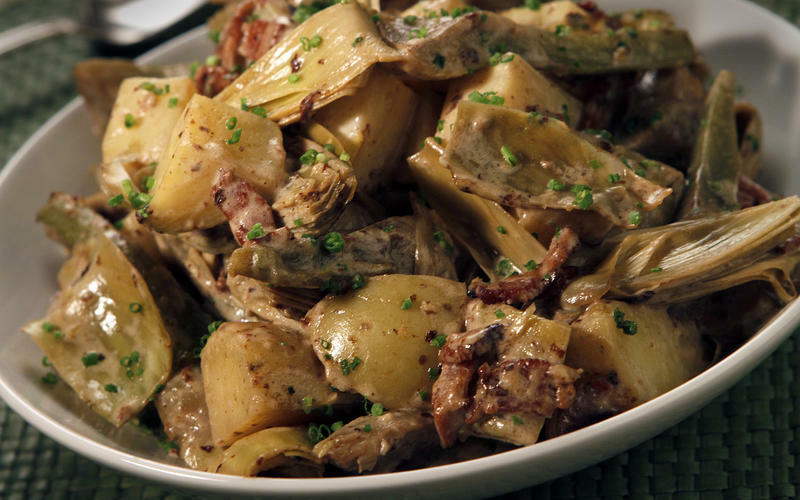 Artichoke, bacon and new potato stew is the right choice that will satisfy all your claims.